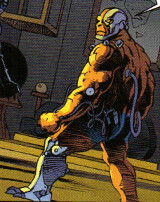 Powers/Abilities: The Deathloks are reanimated corpses controlled by computer brains and augmented by bionic body parts. The Deathloks possess the powers and abilities of their original forms, but they are enhanced by bionic body parts and linked to a controlling artificial intelligence. This both protects them from certain psychic assaults and controls their activities. They utilized an interdimensional information share to adapt as the present of realities they visited changed. Traits: They repeatedly announce their intentions/goals, which sometimes made it easier for their opponents to strategize against them. Weapon Infinity is the collective Deathloks. (Uncanny X-Force I#6 (fb)) - Earth's superhumans arrogantly appointed themselves judges, jury, and executioners. Using the World, Father instigated Operation Deathlok, with the Deathloks mission of killing, reanimating, and converting all superhumans into controllable Deathlok troopers. 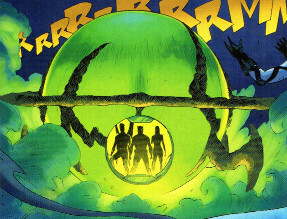 The first wave of Deathloks targeted and killed off specific heroes, the Avengers, Defenders, X-Men, etc. Once killed, their bodies were sent to the World for acclimation and they reemerged as Deathloks. The majority of Earth's human population supported the Deathlok program, which was made into law. 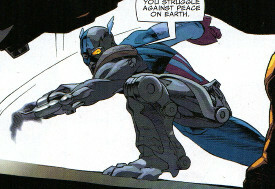 Captain America unified the remaining superhuman population, but in the end they were all converted into Deathloks. With the superhumans under control as Deathloks, humanity flourished, ushering in utopia. (Uncanny X-Force I#6 (fb) - BTS) - The existence of Apocalypse threatened Reality-11045's future timeline, and so the Deathloks were sent out into other realities, allegedly seeding all timelines/dimensions. As "present" realities changed, the Deathloks communicated across realities via interdimensional information share, allowing them to adapt via "precognitive evolution." On Reality-616, Father somehow traveled within the World, in which Fantomex-616 had secretly stored a young reincarnation of Apocalypse in hopes of raising him peacefully. Father directed the Deathloks to locate and access the World and to slay Fantomex. (Uncanny X-Force I#7 (fb) - BTS) - The collective Deathloks became known as Weapon Infinity. (Uncanny X-Force I#5 - BTS) - Fantomex discovered evidence of Weapon Infinity, which had been drastically manipulating the time stream within the World. He determined it to be united, viral, traveling omni-time, and guided by an architect sequestered in a subterranean chamber, deep in the World, entombed under a million years of progress. Fantomex continued to seek the means to destroy the architect of Weapon Infinity, and he realized he/it would seek to do the same to him. (Uncanny X-Force I#5 (fb) - BTS) - Fantomex shrunk the World and kept it in his possession. (Uncanny X-Force I#5 (fb) - BTS) - The Deathloks were given three objective: (1) Acquire the World / safeguard Project Infinity; (2) eliminate Fantomex; (3) terminate any ancillary associates/supporters of Fantomex. (Uncanny X-Force I#5) - A contingent of Deathloks (Captain America, Cyclops, Elektra, Spider-Man, Thing) attacked Fantomex in his home in the French Alps where he kept his mother. While Fantomex held his own against the Deathloks, Captain America located and acquired the World, while Spider-Man slew Fantomex's mother. After Fantomex knocked Captain America-11045 and Spider-Man-11045 out of his home, Hawkeye-11045 blew up the home, with Captain America considering the Thing being still inside the home as acceptable casualties. (Uncanny X-Force I#5 - BTS) - Fantomex narrowly escaped aboard his ship, EVA, which was also damaged and crashed in the snow-covered mountains a short distance away. Fantomex was then confronted by Deathlok-10511. (Uncanny X-Force I#6) - The Deathlok Captain America instructed the others to find and kill Fantomex, but Spider-Man-11045 was swiftly slain in the process; Deathlok-10511 advised Fantomex that something terrible would happen if they did not retrieve the World. (Uncanny X-Force I#6 - BTS) - Deathlok-10511 took out and presumably slew Cyclops-11045. (Uncanny X-Force I#6) - When Deathlok-10511 linked to the Deathlok-11045s' hyper-mind, determining their primary mission, Captain America severed contact and reported this to Father, who noted this Deathlok to be a residual from another timeline and instructed his Deathloks to kill it. They requested target-specific reinforcements to increase the likelihood of the occurrence of their future of origin, and Father agreed to send reinforcements. Seconds later, Deathlok-10511 and Fantomex ambushed the three remaining Deathlok-11045s, with Deathlok swiftly slaying Elektra and Hawkeye and incapacitating Captain America. 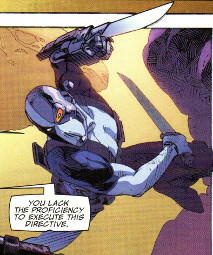 When the "target-specific reinforcements" (Archangel, Deadpool, Psylocke, Wolverine; and presumably Fantomex, behind the scenes) arrived in their own version of EVA, Fantomex initially mistook them for their Reality-616 incarnations before he and Deathlok-10511 fled under their fire. They voiced their updated directives: Acquire the World; Destroy contents of laboratory (young En Sabah Nur); Protect Father. Using Captain America's shield to cushion the fall, Deathlok-10511 leapt off a ledge with Captain America-11045 and Fantomex; they were then reunited with the rest of X-Force-616 (Archangel, Deadpool, Psylocke, Wolverine). Aboard EVA, Fantomex reclaimed the World and updated his teammates on recent events. EVA then bonded to Captain America-11045's memories and led him to review his reality's past. Further noting that they could not be stopped due to their precognitive evolution, Cap-11045 further revealed that Father was deep in the World. When EVA-11045 attacked, Cap-11045, overcome by his memories, took advantage of the distraction, grabbed Deadpool-616's gun, and fatally shot himself in the head. (Uncanny X-Force I#6 - BTS) - After Fantomex-616 -- with Deathlok-10511 -- joined up with his X-Force allies aboard EVA, X-Force-11045 attacked via their own EVA. Fantomex briefly escaped via taking EVA-616 down to the Sahara desert, planning to enlarge and enter the World and to kill Father and his future. (Uncanny X-Force I#7 - BTS) - Fantomex-616 brought Deathlok-10511 and the rest of X-Force into the World. With Weapon Infinity perpetually traveling in time, Deathlok-10511 felt that if they failed to kill Father, the sentient Infinity would become so ingrained that it would be impossible to stop. X-Force and Deathlok split up into pairs (although Deadpool and Fantomex soon became irate with each other and parted ways) to cover more ground in the immense World. Father watched their progress, noting that they were performing as expected, making Father so proud. (Uncanny X-Force I#7) - The Deathlok Wolverine and Deadpool-11045 attacked Wolverine-616 and Deathlok-10511, respectively; Wolverine-616 figured the only way they could have gotten that close without his detecting them was if the World was helping Weapon Infinity. Wolverine-11045 nearly slew Wolverine-616 before Father called both Wolverine and Deadpool-11045. The Deathlok Archangel and Psylocke-11045 attacked Archangel and Psylocke-616; when Psylocke-11045 took mental control of Archangel-616, Psylocke-616 hurled her katana into Psylocke-11045's forehead, instantly killing her. Meanwhile, Deadpool-616 encountered Father, who telepathically made Deadpool feel as if Father was his father, making Deadpool -- who was already feeling rejected by X-Force -- feel like a little kid and be sympathetic to Father. Fantomex-11045 -- misdirecting Fantomex-616 into believing him to be Deathlok-10511 -- approached Fantomex-616 as he attempted to check on the young En Sabah Nur he was nurturing. Via this, Father learned where Fantomex was hiding the young Apocalypse. Realizing he was being misdirected, Fantomex-616 briefly battled Fantomex-11045 before Weapon XV/Ultimaton -- sensing the danger to Fantomex-616 -- emerged from the laboratory and slew Fantomex-11045. Most desiring the laboratory sealed and young En Sabah Nur protected, Fantomex-616 ordered Ultimaton back into the vault, which he then sealed. Father then sent Wolverine and Deadpool-11045 to take down Fantomex-616 and force their way into the lab to get to the young Apocalypse. The pair overpowered Fantomex-616, and Deathlok-11045 prepared to slay Fantomex-616 while Deadpool-11045 forced his way into the lab. However, when Father went to far in portraying a familial relationship with Deadpool, promising him "cake and a kiss on his forehead as he tucked him in," Deadpool was disgusted, threw off Father's influence, and decapitated him. With Father's death, Weapon Infinity vanished, seemingly ceasing to exist. Comments: Created by Rick Remender, Esad Ribic, and John Lucas. I guess it was sometime after this storyline that Deathlok-10511 became obsessive about not killing. He specifically slew Cyclops and Elektra-11045, and he noted that "all agents of the future must be killed." Why did everybody vanish when Father was killed? Why was Father based in the World of present day Reality-616? And why is Philippines spelled with a "Ph" and two p's before the second "i" but Filipino if spelled with an "F" and only one "p"? ...and I'm not sure if the Deathlok in Reality-13021 -- who was used by Stryfe (Hope Summers) and Blaquesmith to predict how altering past events might affect their future (Cable and X-Force#13) -- was that future's Deathlok-10511, or whether they had brought forward the Deathlok-10511 from Reality-616's modern era; I personally think the former. Like his Reality-616 counterpart, he could fly via powerful metallic wings. His left arm apparently featured a large missile launcher. His computer-controlled brain could less swiftly react to unpredictable moves than his -616 counterpart. Archangel was one of the heroes converted into one of the Deathloks of the collective Weapon Infinity. Weapon Infinity was sent into the past of various realities to slay Apocalypse and take other steps to ensure the future of Reality-11045. (Uncanny X-Force I#6 - BTS) - Via guidance from Captain America-11045, Hawkeye-11045 requested target-specific reinforcements to increase the likelihood of the occurrence of their future of origin, and Father agreed to send reinforcements. (Uncanny X-Force I#6) - Aboard their own version of Fantomex's EVA, the "target-specific reinforcements" (Archangel, Deadpool, Psylocke, Wolverine; and presumably Fantomex, behind the scenes) arrived a short distance from Fantomex's recently destroyed base. They voiced their updated directives: Acquire the World; Destroy contents of laboratory (young En Sabah Nur); Protect Father. Fantomex initially mistook them for their Reality-616 incarnations before he and Deathlok-10511 fled under their fire. (Uncanny X-Force I#6 - BTS) - After Fantomex-616 -- with Deathlok-10511 -- joined up with his X-Force allies aboard EVA, X-Force-11045 attacked via their own EVA. Fantomex briefly escaped via taking EVA-616 down to the Sahara desert. (Uncanny X-Force I#7) - After Fantomex enlarged the World in hopes of taking down Father, the X-Force-11045 group entered as well. Carrying Psylocke-11045, Archangel located and targeted Archangel and Psylocke-616 (the former of whom was carrying the latter). 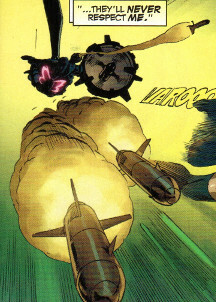 Archangel-11045 fired a missile that Archangel-616 was forced to use his wings as a shield to protect Psylocke from, though his wings took some damage. 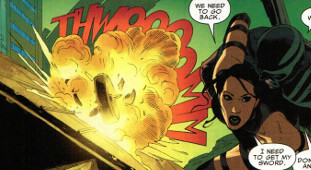 Psylocke-11045 briefly took psychic control of Archangel-616, but Psylocke-616 terminated this by hurling her sword through Psylocke-11045's head, killing her. Noting "Associate lifespan completed," Archangel-11045 discarded her to continue the chase, but the freed Archangel-616 abruptly changed direction just before he would have crashed into a wall. Unable to make the same flight change, Archangel-11045 crashed into the wall and was apparently killed in the resultant explosion. Notes: I would guess Archangel-11045's corpse and his shield vanished when the rest of Weapon Infinity vanished upon Deadpool's slaying of Father. Archangel is also pictured in the main image, although he is also shadowed in that picture. His best straight-on image is here. Presumably Steve Rogers, but possibly another Captain America incarnation. 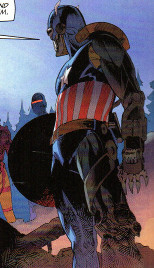 Captain America was one of the heroes converted into one of the Deathloks of the collective Weapon Infinity. Like his Reality-616, he possessed the pinnacle of physical abilities (strength, speed, reflexes, etc.) and was a master strategist; these abilities were further augmented by his bionic and computer implants. He possessed a durable, possibly indestructible shield. He communicated directly with Father. (Uncanny X-Force I#6 (fb)) - Captain America unified the remaining superhuman population against Operation Deathlok, but in the end they were all converted into Deathloks. (Uncanny X-Force I#5 (fb) - BTS) - A contingent of Deathloks (Captain America, Cyclops, Elektra, Hawkeye, Spider-Man, Thing) were sent to Reality-616 and given three objective: (1) Acquire the World / safeguard Project Infinity; (2) eliminate Fantomex; (3) terminate any ancillary associates/supporters of Fantomex. (Uncanny X-Force I#5) - Captain America led this contingent of Deathloks to attack Fantomex in his home in the French Alps where he kept his mother. As Cyclops initiated the assault, Captain America and the others infiltrated the building while Hawkeye waited outside. While Fantomex held his own against the Deathloks, Captain America located and acquired the World. After Fantomex knocked Captain America and Spider-Man out of his home, Hawkeye blew up the home, with Captain America considering the Thing being still inside the home as acceptable casualties. (Uncanny X-Force I#5 - BTS) - Fantomex narrowly escaped aboard his ship, EVA, which was also damaged and crashed in the snow-covered mountains a short distance away, where he was joined by Deathlok-10511. (Uncanny X-Force I#6) - The Deathlok Captain America-11045 instructed the others to find and kill Fantomex. (Uncanny X-Force I#6 - BTS) - Fantomex slew Spider-Man-11045, and Deathlok-10511 slew Cyclops-11045. (Uncanny X-Force I#6) - When Deathlok-10511 linked to the Deathlok-11045s' hyper-mind, determining their primary mission, Captain America severed contact and reported this to Father, who noted this Deathlok to be a residual from another timeline and instructed his Deathloks to kill it. The Deathloks requested target-specific reinforcements to increase the likelihood of the occurrence of their future of origin, and Father agreed to send reinforcements. Seconds later, Deathlok-10511 and Fantomex ambushed the three remaining Deathlok-11045s, with Deathlok-10511 swiftly slaying Elektra and Hawkeye and incapacitating Captain America. 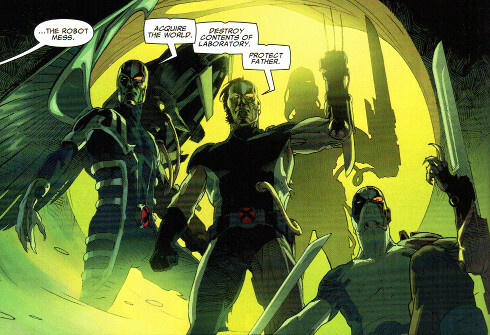 When the reinforcements (Archangel, Deadpool, Psylocke, Wolverine; and presumably Fantomex, behind the scenes) arrived in their own version of EVA, Fantomex and Deathlok-10511 fled under their fire. Using Captain America's shield to cushion the fall, Deathlok-10511 leapt off a ledge with Captain America-11045 and Fantomex; they were then reunited with the rest of X-Force-616 (Archangel/Warren Worthington, Deadpool/Jack/"Wade Wilson," Psylocke/Betsy Braddock, Wolverine/James Howlett/Logan). Aboard EVA, Fantomex reclaimed the World and updated his teammates on recent events. EVA then bonded to Captain America-11045's memories and led him to review his reality's past. Further noting that they could not be stopped due to their precognitive evolution, Cap-11045 further revealed that Father was deep in the World. When EVA-11045 attacked, Cap-11045, overcome by his memories, took advantage of the distraction, grabbed Deadpool-616's gun, and fatally shot himself in the head. Notes: I would guess Captain America-11045's corpse and his shield vanished when the rest of Weapon Infinity vanished upon Deadpool's slaying of Father. 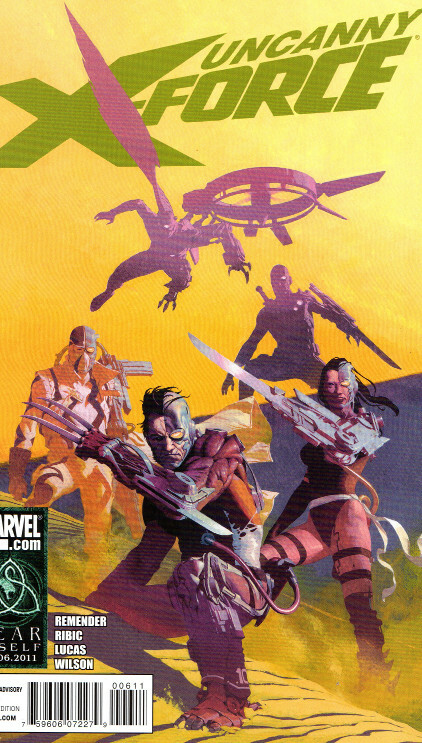 The cover of Uncanny X-Force I#5 shows the Deathlok Captain America to be costumed like Steve Rogers: Super-Soldier, or whatever his unmasked ID was when he was letting Bucky be Cap. 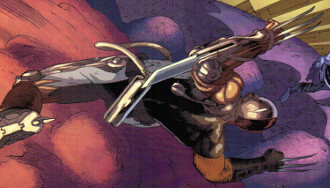 Cyclops was one of the heroes converted into one of the Deathloks of the collective Weapon Infinity. 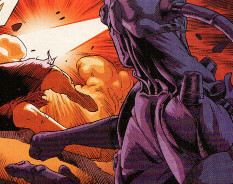 Like his Reality-616 counterpart, Cyclops' primary weapon was his powerful eyeblasts, but his body and mind were augmented by bionics and computer implants. (Uncanny X-Force I#5) - These Deathloks attacked Fantomex in his home in the French Alps where he kept his mother. 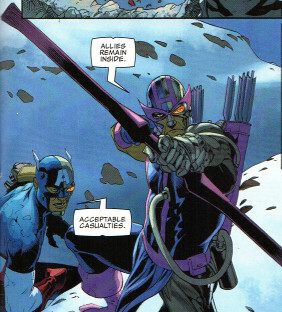 As Cyclops initiated the assault, Captain America and the others infiltrated the building while Hawkeye waited outside. 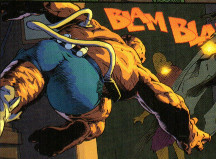 Spotting Cyclops outside his window, Fantomex dove to knock his mother to safety as Cyclops fired a blast into the house. As Cyclops continued his efforts to execute Fantomex, the others joined in. After Fantomex knocked Captain America and Spider-Man out of his home, Hawkeye blew up the home, with Cyclops and Elektra making it outside safely. (Uncanny X-Force I#6) - The Deathlok Captain America instructed the others to find and kill Fantomex. Notes: I would guess Cyclops-11045's corpse vanished when the rest of Weapon Infinity vanished upon Deadpool's slaying of Father. (Uncanny X-Force I#6 (fb)) - Overwhelmed by at least three Deathloks, Daredevil was brought, beaten and bleeding before the Deathlok Punisher. (Uncanny X-Force I#6 (fb) - BTS) - Daredevil was presumably converted into one of the Deathloks / Weapon Infinity. Note: This would presumably be Matt Murdock, although there are certainly other Daredevil incarnations. Behind the Punisher, we see two characters who look like the Vision and the Thing; we know the Thing became one of the Deathloks, but Vision is unconfirmed. The collar, shape of his head, the shoulders to chest costume pattern and the pattern/style of his briefs are fairly convincing. I can't see a solar gem, and the symbol on his chest doesn't look like the typical diamond we see on the Vision's chest. His face looks to have a split pattern to it, but would likely be a deathlok bionic/computer implant, as most Deathloks seem to share. Deadpool was one of the heroes converted into one of the Deathloks of the collective Weapon Infinity. Like his Reality-616 counterpart, he was presumably a master warrior able to swiftly heal from nearly any assault. He was highly proficient with bladed weapons and was augmented by his computer and bionic implants, which included a large blade coming off his left arm. (Uncanny X-Force I#7) - After Fantomex-61 enlarged the World in hopes of taking down Father, the X-Force-11045 group entered as well. (Uncanny X-Force I#7) - Wolverine and Deadpool-11045 attacked Wolverine-616 and Deathlok-10511, respectively; Wolverine-616 figured the only way they could have gotten that close without his detecting them was if the World was helping Weapon Infinity. 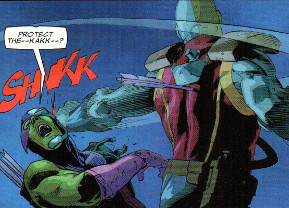 Deadpool sliced Deathlok's energy gun in half, but Deathlok extended his energy claws as he turned and faced his foe. When Deadpool announced his directive to terminate the anomalous Deathlok, Deathlok-10511 noted that Deadpool-11045 lacked the proficiency to executive this directive and that his future was doomed; to punctuate his point, he slashed Deadpool-11045 in the side with his claws. Soon after, however, Deadpool (along with Wolverine)-11045 was called away to defeat Fantomex in order to enter the lab and destroy the young En Sabah Nur. 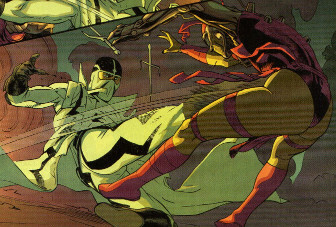 Recognizing the danger, Fantomex jokingly requested his opponents allow him to fight them one-at-a-time. Ignoring this, Deadpool and Wolverine-11045 brutally assaulted Fantomex, and when Fantomex was nearly incapacitated, Deadpool turned his attention to slashing his way into the lab. Just as Deadpool-11045 was about to succeed, Deadpool-616 slew father. With Father's death, Deadpool and the rest of Weapon Infinity vanished, seemingly ceasing to exist. Elektra was one of the heroes converted into one of the Deathloks of the collective Weapon Infinity. Like her Reality-616 counterpart, Elektra was a master martial artist and ninja, typically using the sai as her weapon of choice. Her body and mind were augmented by bionics and computer implants. Cyclops initiated the assault, while Elektra and the others infiltrated the building while Hawkeye waited outside. As Fantomex held his mother and dodged Cyclops' blasts, Elektra joined the assault, soon followed by Captain America, the Thing, and Spider-Man. (Uncanny X-Force I#6) - Captain America-11045 instructed the others to find and kill Fantomex. After Captain America noted that both Cyclops and Spider-Man were unresponsive (having been slain by Deathlok-10511 and Fantomex, respectively) and blocked Deathlok-10511 from their hyper-mind, Captain America contacted Father to request threat-specific reinforcements. Elektra noted to Father that their tachyconcast probability generator showed chances of their future of origin occurring at 56.12%; when Hawkeye noted that they required target-specific reinforcements to increase their success rate, Father sent such reinforcements. (Uncanny X-Force I#6) - Fantomex and Deathlok-10511 then ambushed Elektra, Captain America, and Hawkeye. Dodging the initial gunfire, Elektra apparently fell before an energy blast from Deathlok. Notes: I would guess Elektra-11045's corpse vanished when the rest of Weapon Infinity vanished upon Deadpool's slaying of Father. Merged with Deathlok-tech, EVA was either part of or closely allied with the collective Weapon Infinity. Like her Reality-616 counterpart, she can fly, transport others, fire energy blasts, and likely think and communicate verbally. Fantomex was one of the heroes converted into one of the Deathloks of the collective Weapon Infinity. (Uncanny X-Force I#6 - BTS) - After Fantomex-616 -- with Deathlok-10511 -- joined up with his X-Force allies aboard EVA, X-Force-11045 attacked via their own EVA. Fantomex-616 briefly escaped via taking EVA-616 down to the Sahara desert. (Uncanny X-Force I#7 (fb) - BTS) - After Fantomex enlarged the World in hopes of taking down Father, the X-Force-11045 group entered as well. (Uncanny X-Force I#7) - When Fantomex-616 attempted to check on the young Apocalypse he was nurturing in his laboratory within a vault, Fantomex-11045 -- misdirecting Fantomex-616 into believing him to be Deathlok-10511 -- approached Fantomex-616, getting close enough to realize where their quarry was and to share with Father that he knew. Father taunted Fantomex-616 with a message in the code he was checking, "I know what you're growing and now I know where." Seeing this, Fantomex realized he was being misdirected, and he swiftly turned and aimed his gun at the face of "Deathlok," upon which point Fantomex-11045 dropped the illusions and face his counterpart. Fantomex-11045 was able to anticipate, avoid, and/or counter Fantomex-616's assaults until Weapon XV/Ultimaton -- sensing the danger to Fantomex-616 -- emerged from the laboratory. Fantomex swiftly identified his counterpart as "the bad one," and Ultimaton slew Fantomex-11045. Notes: I would guess Fantomex-11045's corpse vanished when the rest of Weapon Infinity vanished upon Deadpool's slaying of Father. 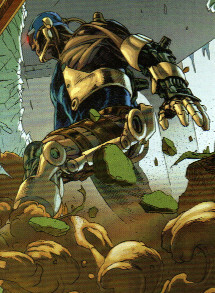 Hawkeye was one of the heroes converted into one of the Deathloks of the collective Weapon Infinity. 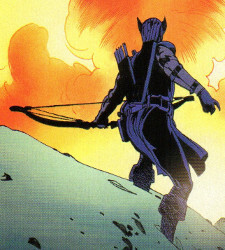 Like his Reality-616 counterpart, Hawkeye was a supremely skilled archer and marksman, carrying a bow with various conventional and "trick" arrows outfitted with various weapons, such as explosives or adhesive putty. His body and mind were augmented by bionics and computer implants. After Fantomex knocked Captain America (who had obtained the shrunken World) and Spider-Man out of his home, Hawkeye blew up the home in hopes of taking out Fantomex as well, with Captain America considering the Thing being still inside the home as acceptable casualties. (Uncanny X-Force I#5 - BTS) - Fantomex narrowly escaped aboard his ship, EVA, which was also damaged and crashed in the snow-covered mountains a short distance away, where Fantomex was joined by Deathlok-10511. Elektra noted to Father that the chances of their future of origin occurring at 56.12%; when Hawkeye noted that they required target-specific reinforcements to increase their success rate, Father sent such reinforcements. (Uncanny X-Force I#6) - Fantomex and Deathlok-10511 then ambushed Elektra, Captain America, and Hawkeye. Via some sort of paste/putty arrow, Hawkeye stuck Fantomex to a tree. Pending the arrival of reinforcements, Hawkeye attempted to protect Captain America as the holder of the World, taking a number of bullets(?) from Deathlok-10511, sufficient to cause Hawkeye to note "unit in distress." Captain America fled to protect the World and to gather the reinforcements, and when Hawkeye shots a standard point-tipped arrow through Deathlok-10511's chest, Deathlok turned and apparently slew him with a strike to his head. Notes: I would guess Hawkeye-11045's corpse vanished when the rest of Weapon Infinity vanished upon Deadpool's slaying of Father. 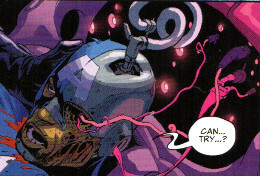 (Uncanny X-Force I#6 (fb) - BTS) - Iron Man was presumably converted into one of the Deathloks / Weapon Infinity. Note: We might assume that this Iron Man was Tony Stark, but it certainly could have been Jim Rhodes, Happy Hogan, Eddie March, or any of the other Iron Man armor wearers. (Uncanny X-Force I#6 (fb)) - Namor apparently fell to the Deathloks during their first wave assault that targeted and killed the X-Men, Avengers, and Defenders. 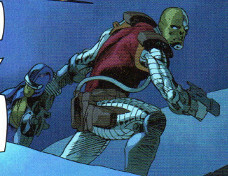 Alongside Strom, he was transported by Deathlok conversion. As a Deathlok and alongside a similarly-Deathlok Storm, he stood before a group of other Deathloks. You can see his Deathlok form in the Storm sub-profile. 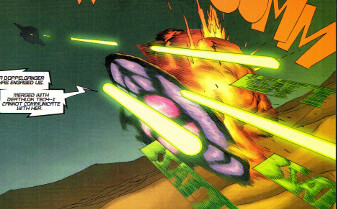 Psylocke was one of the heroes converted into one of the Deathloks of the collective Weapon Infinity. Carried by Archangel-11045, Psylocke located and targeted Archangel and Psylocke-616 (the former of whom was carrying the latter). Noting "Associate lifespan completed," Archangel-11045 discarded Psylocke to continue the chase, although he also perished seconds later. Notes: I would guess Psylocke-11045's corpse vanished when the rest of Weapon Infinity vanished upon Deadpool's slaying of Father. Psylocke is best shown in a mostly full body image in the main profile. She's also shown as that group exits EVA, but she's in the back and in full shadow. (Uncanny X-Force I#6 (fb)) - Already converted into a Deathlok, the Punisher witnessed, participated in, and/or supervised the capture of Daredevil. Note: This was presumably Frank Castle, but there are certainly multiple Punisher incarnations. (Uncanny X-Force I#6 (fb)) - Storm apparently fell to the Deathloks during their first wave assault that targeted and killed the X-Men, Avengers, and Defenders. Alongside Namor, she was transported by Deathlok conversion. As a Deathlok and alongside a similarly-Deathlok Namor, she stood before a group of other Deathloks. You can see her defeated pre-Deathlok form in the Namor sub-profile. The Thing was one of the heroes converted into one of the Deathloks of the collective Weapon Infinity. Like his Reality-11045 counterpart, he was extremely strong and durable. As Cyclops initiated the assault, the Thing and the others infiltrated the building while Hawkeye waited outside. When the Thing attacked, Fantomex tore off a curtain and wrapped it around the Thing's head, mockingly noting that he wanted to cover the Thing's face and then teasing at how fashionable this new face scarf was. Fantomex then drew his dagger and stabbed through the curtain and through the top of the Thing's head. Though he stopped fighting thereafter, the Thing did not fall. (Uncanny X-Force I#5 - BTS) - After Fantomex knocked Captain America and Spider-Man out of his home, Hawkeye blew up the home, with Captain America considering the Thing being still inside the home as acceptable casualties. Notes: I would guess the Thing-11045's corpse vanished when the rest of Weapon Infinity vanished upon Deadpool's slaying of Father. 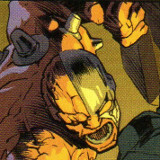 Wolverine was one of the heroes converted into one of the Deathloks of the collective Weapon Infinity. Like his Reality-616 counterpart, he had Adamantium claws, enhanced senses, healing, etc., and extreme fighting prowess, augmented by his computer and bionic implants. (Uncanny X-Force I#7) - The Deathlok Wolverine and Deadpool-11045 attacked Wolverine-616 and Deathlok-10511, respectively; Wolverine-616 figured the only way they could have gotten that close without his detecting them was if the World was helping Weapon Infinity. Wolverine-11045 nearly slew Wolverine-616 before Father redirected both Wolverine and Deadpool-11045 to defeat Fantomex in order to enter the lab and destroy the young En Sabah Nur. Recognizing the danger, Fantomex jokingly requested his opponents allow him to fight them one-at-a-time. Ignoring this, Deadpool and Wolverine-11045 brutally assaulted Fantomex, and when Fantomex was nearly incapacitated, Wolverine prepared to finish him off while Deadpool began slashing his way into the lab. Just as Wolverine-11045 was about to slay Fantomex-616, however, Deadpool-616 slew Father. With Father's death, Wolverine-11045 and the rest of Weapon Infinity vanished, seemingly ceasing to exist. Note: Wolverine is best seen in the main profile's top right image.